The predicament has growers and exporters working to secure profitable trade agreements by using the same fair trade format developed by the coffee industry. The fair trade model guarantees a price floor for a high-quality crop. Exporters in turn can sell fair trade goods at a premium over commodity prices. The model has helped many coffee farmers make more money than if they sold at market prices and it could work for quinoa farmers, too. “We’re at this inflection point where we want people to know where their quinoa is coming from, and the consumer actually is willing to pay (the farmers) a little more so they do put their kids through school,” said Bolivian native Sergio Nunez de Arco in an interview with The Washington Post. De Arco helped found a California-based import company for quinoa. 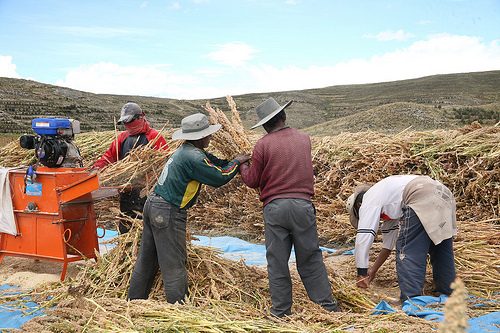 De Arco and other leaders are pushing for improved infrastructure and fair trade partnerships to maintain higher living standards for for traditionally poor Andean quinoa farmers. For centuries Andean people have been eating quinoa as a staple. The low calorie grain, which grows best at higher elevations, has been described as a “superfood.” Health conscious Westerners love quinoa because it is high in protein, has many amino acids, and is gluten-free. A natural choice for vegetarians looking for a protein-rich food, its popularity has catapulted the grain beyond the South American mountains where it originated. Because of its popularity, skyrocketing quinoa prices have begun to put the staple food out of reach in regions where it is grown, the The New York Times reported in 2011. But foodies can continue eating quinoa guilt-free: Bolivian farmers now point out that the increased demand has boosted the economy in their traditionally poor regions. Quinoa farmers in Bolivia’s Southern Highlands, one of its poorest regions, have seen their incomes grow as quinoa prices tripled between 2006 to 2011. Rollet noted that Bolivia’s rural farmers set aside about 10 percent of the harvest for themselves. Many poorer urban people in cities like La Paz may not be able to afford the grain, but it isn’t a staple food for them, according to NPR. Bolivian farmers saw their incomes rise from $35 a month per family before quinoa gained international popularity to $220 per month. This dramatic increase in income has provided a much greater livelihood for the farmers’ families. But now the Andean farmers and exporters worry that international competition will catch up. The increased price of quinoa has not only pushed farmers in Bolivia, Peru, and Ecuador to plant more acres of quinoa, but farmers in the U.S. and Canada have also started planting the grain. If worldwide production equalized supply to demand, South American farmers could see their gains disappear. Infrastructure in places like Colorado makes it much easier for quinoa to get to Western markets than in Bolivia and other South American countries. While Andean farmers’ cooperatives and exporters are working to protect native quinoa farmers, some experts note that they may be further ahead of the trend than they think. The Washington Post recently reported that quinoa production may not take off in the Western world and agribusiness is not biting at the opportunity. Andean farmers are eating better and are finding a bigger place on the world stage. Now they are hoping that the West won’t get involved before they can cement their place as the premier producers of quinoa. Editor’s note: This post originally appeared on Global Envision, a blog site focused on market solutions to poverty, manged by Mercy Corps – a NextBillion Content Partner.